Written by Andrew Plotkin. XYZZY Awards 1998: Winner of Best Game, Best Puzzles, Best Individual NPC (the interrogator), Best Individual Puzzle (getting out of the chair), Best Use of Medium. 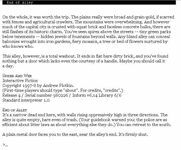 Spider and Web is an ingenious text adventure in which you are a captured spy. The game takes place in two parallel storylines: in the first, you're being interrogated by a ruthless questioner; in the second, you're "answering" the questions by reliving your spy activities.